Gazelle is the common name for any of the various small, swift antelopes of Africa and Asia comprising the genus Gazella and the related genera Eudorcas and Nanger, characterized by a slender neck, long legs, and curved, lyre-shaped horns that are upturned at the ends and tend to be heavily ringed. The members of Eudorcas and Nanger used to be included within Gazella, when these were considered subgenera, and in some taxonomies the species remain in Gazella (ITIS 2006). While these are the "true gazelles," three closely related species, comprising the genus Procarpa, also are widely referred to as gazelles. The herbivorous gazelles are important to food chains, being consumed by numerous predators, including cheetahs, lions, leopards, hyenas, jackals, and so forth. Their swift running ability requires stealth on the part of the predators to get close enough to attack, or the ability to find the newborns hiding motionless in the grass. The graceful running and unique bouncing and jumping of the fleeing gazelle is often featured in wildlife documentaries. As antelopes, gazelles are slender-built and swift bovids (even-toed ungulates of the family Bovidae) with hollow and lightweight horns. Gazelles are known as swift animals. 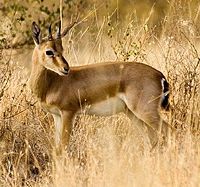 The Thomson's gazelle (Eudorcas thomsonii) is reported to reach a speed of about 50 miles per hour (80 kilometers per hour) (Darcy 2006). Gazelles are mostly found in the grasslands and savannas of Africa, but they are also found in southwest Asia. They tend to live in herds and will eat less coarse, easily digestible plants and leaves. Then typically are small, only about two to three feet high at the shoulder (less than a meter), and generally brown to fawn colored, often with a light stripe on the face and a dark horizontal band on the sides. A recognizable example of the gazelle is Thomson's gazelle, which is around 60 to 90 centimeters (23 to 35 inches) in height at the shoulder and is colored brown and white with a distinguishing black stripe. The males have long, often curved, horns. Tommies, as they are familiarly called, exhibit a distinctive behavior of stotting (running slowly and jumping high before fleeing) when they are threatened by predators such as lions or cheetahs. 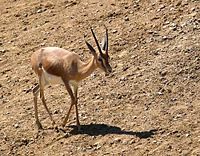 The smallest of the gazelle species is the Speke's gazelle (Gazella spekei), which has a shoulder height of about 50 to 60 centimeters (1.6-2 feet), a body length of 95 to 105 centimeters (3.1-3.5 feet), a tail length of 15 to 20 centimeters (6-8 inches), and a weight of 15 to 25 kilograms (33-55 pounds) (Huffman 2004). It is confined to the stony brush, grass steppes, and semideserts of Ethiopia and Somalia in the horn of Africa (Huffman 2004). The mountain gazelle (Gazella gazella) is widely but unevenly distributed across the Arabian Peninsula. It inhabits mountains, foothills, and coastal plains. Its range coincides closely with that of the acacia trees that grow in these areas. It is mainly a grazing species, though this varies with food availability. The Dama gazelle (Nanger dama; formerly Gazella dama), also known as the Addra gazelle, lives in Africa in the Sahara desert and migrates south in search of food during the dry season. After the rains return and the desert plants turn green, they move north back to the Sahara. The Grant's gazelle (Nanger granti) is distributed from northern Tanzania to southern Sudan and Ethiopia, and from the Kenyan coast to Lake Victoria. 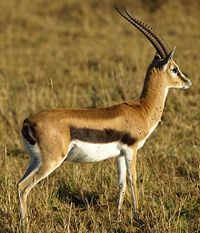 The Grant's gazelle looks similar to a Thomson's gazelle except its lyre-shaped horns are stout at the base, strongly ringed, and measuring 18 to 32 inches long. The Dorcas gazelle (Gazella dorcas), also known as the Ariel gazelle, is a small and common gazelle that stands approximately 53 centimeters (21 inches) tall. The numerous subspecies of the Dorcas gazelle survive on vegetation in grassland, steppe, wadis, mountain desert, and in semi-desert climates of Africa, Arabia, and into Iran, and northern India. About 35,000 to 40,000 exist in the wild. Members of the genus Procapra also have the common name of gazelle. This genus includes three species: Mongolian gazelle (Procapra gutturosa), Tibetan gazelle (Procapra picticaudata), and Przewalski's gazelle (Procapra przwalskii). The Mongolian gazelle, or Zeren, is a medium-sized antelope native to the semi-arid Central Asian steppes of Mongolia, as well as some parts of Siberia and China. They have a distinctive heart-shaped white patch on their rump area. The males have lyre-shaped horns which curl backwards from the forehead. 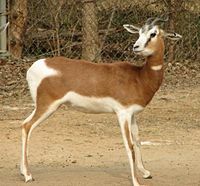 The Tibetan gazelle, or goa, inhabits the Tibetan plateau. A typical goa stands about two feet (60 centimeters) tall at the shoulder and weighs about 15 kilograms. 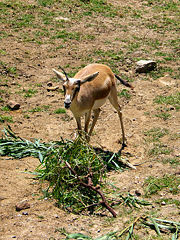 Males have long, tapering, ridged horns, reaching lengths of up to 14 inches (35 centimeters). Females have no horns; neither have they distinct facial markings. Przewalski's Gazelle is found only in China. Once widespread. its range has declined to 4 populations near Qinghai Lake. The animal is yellowish brown with white spots on its rump, with a body length of 100 centimeters, a tail of 7 to 10 cm and a weight of around 21–32 kg. Males are the only ones that bear antlers, which bend inwards at the tips. The gazelle species are classified as part of the order Artiodactyla, family Bovidae, and genera Gazella, Eudorcas, and Nanger. Members of the Artiodactyla order are principally distinguished by the foot; they have an even number of toes. The taxonomy of these genera is a confused one, and the classification of species and subspecies has been an unsettled issue. Three species—the red gazelle, the Arabian gazelle, and the Queen of Sheba's gazelle—are recently extinct. All other gazelle species are listed as endangered, to varying degrees. Fossils of genus Gazella are found in Pliocene and Pleistocene deposits of Eurasia and Africa. The tiny Gazella borbonica is one of the earliest European gazelles, characterized by its small size and short legs. Gazelles disappeared from Europe at the start of Ice Age, but they survived in Africa and the Middle East. Three species become extinct in recent times due to human causes. Darcy, P. 2006. Weird science: Fast animals. Twisted Mind Emporium. Retrieved October 15, 2008. Estes, R. D. 1991. The Behavior Guide to African Mammals: Including Hoofed Mammals, Carnivores, Primates. Berkeley, CA: University of California Press. ISBN 0520058313. Heckel, J.-O., O. G. Amir, X. Y. Kaariye, and F. Wilhelmi. 2008. Gazella spekei. 2008 IUCN Red List of Threatened Species. Retrieved October 15, 2008. Huffman, B. 2004. 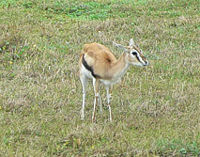 Gazella spekei (Speke's gazelle). Ultimate Ungulate. Retrieved October 16, 2008. Huffman, B. 2007. Subfamily Antilopinae. Gazelles, dwarf antelopes, and relatives. Ultimate Ungulate. Retrieved October 16, 2008. Integrated Taxonomic Information System (ITIS). 2004. Gazella Blainville, 1816. ITIS Taxonomic Serial No. : 624969. Retrieved October 15, 2008. Kingdon, J. 1997. The Kingdon Field Guide to African Mammals. San Diego: Academic Press. ISBN 0124083552. Myers, P., R. Espinosa, C. S. Parr, T. Jones, G. S. Hammond, and T. A. Dewey. 2008. Genus Gazella. Animal Diversity Web (online). Retrieved October 15, 2008. This page was last modified on 17 October 2008, at 05:04.